Upon diagnosis we were told that the only 'treatment' we could give was 51ml per day of Lorenzo's oil, and also to put Jacob on a very low fat diet (less than 3% fat, roughly 30g of fat per day). This was supplemented with a complete multivitamin. However, this treatment is normally only successful in treating pre-symptomatic boys. The daily drinking of the Lorenzo's oil was a very stressful experience! Jacob hated drinking it. We tried mixing it with every juice/drink we could think of but it didn't mix well if at all with anything except mango juice. Despite Jacobs hatred of the oil, he took it every day! imagine drinking pure glupy oil every day! not nice! A few days before xmas it was decided that Lorenzo's oil was having no effect on Jacob's ALD and we should stop. No ill effects were noticed after stopping and no more Lorenzo's oil stresses on Xmas day! If you want to know more about the oil and the myelin sheath....the fatty sheath surrounding the nerves in the brain please visit: www.myelin.org/lorenzosoil. We were told to put Jacob on a very low fat diet of less than 3% fat which we did... straight away... we removed as much processed food as possible from Jacob's diet and started making meals with organic foods. We strongly believe that processed food causes problems for many people and Jacob needed to be detoxed thoroughly. Jacob rapidly lost weight and so when we stopped the Lorenzo's oil we also decided to introduce a little more fat into the diet. On an average day Jacob will have around 20g of fat, and looks much healthier for it. The fats in the foods we eat don't agree with kids with ALD... so although we were told 30g each day we decided to reduce to 20g.. if the fat isn't good try and limit as much as possible. Jacob was always quite overweight anyway and losing the weight has been very beneficial for Jacob and he loves his new looks!! Jacob is now on the Paleo Diet. I was reading a book by Terry Wahls who is a Dr in the USA who was diagnosed with progressive MS. She has managed to turn her life around through food! this book is remarkable!... and as MS is a similar disease to ALD, where the Myelin Sheath is attacked, we thought we would try this. Jake has taken amazingly to the diet... in fact we are all doing it! the basics of this diet is the cave man diet... going back to basics - meat/veg/seeds/nuts etc... Terry went from being completely wheelchair bound to riding a bike! For more info please see Terry's website terrywahls.com... or if you like reading grab her book! very inspiring! A few months before diagnosis we felt Jacob may have some sort of behavioral problems. After researching how to help the brain function we came across Eye Q by Equazen. Eye Q contains a blend of essential fatty acids, Omega 3 and Omega 6 as well as EPA, DHA. All essential for the brain in general, as well as Omega 3 and 6 being involved in the myelin repair. 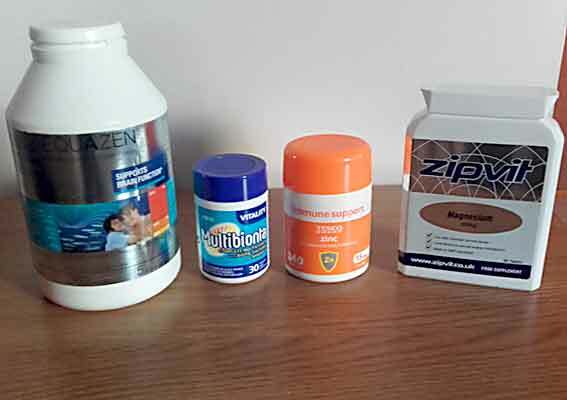 The Equazen website is a mine of information and has results of trials etc... it is worth taking a look www.equazen.co.uk - it also explains how these can benefit the function of the brain. Equazen recommend a dose of 6 capsules a day for 3 months and then 2 capsules a day after that. When we reduced the dosage from 6 to 2 we noticed a quick deterioration in Jacob. We increased the dose back to 6 and Jacob stabilized again... what was also unbelieveable... David, Jacobs healer, within 2 days of reducing his dose, while healing David picked up that Jacob had started to lack Omega 3 and 6!! A Complete multivitamin plus probiotics and minerals. To support your energy metabolism to help keep you full of vitality! Unlike ordinary vitamins Multibionta contains a unique blend of probiotics, combined with essential vitamins and minerals to support your energy, help keep the gut clean and fight infections etc. Helps Jake with his constipation to! Zinc is found in cells throughout the body. It is needed for the body`s defensive (immune) system. It plays a role in cell division, cell growth, wound healing and the breakdown of carbohydrates. We put Jake on this after reading Terry Wahls book .. helps with muscle ache and spasms, nerve function, energy production, bone and cell formation, fatigue, cramp, poor digestion amongst other benefits.